I came across your book Skin Hunger a week ago. I loved it. 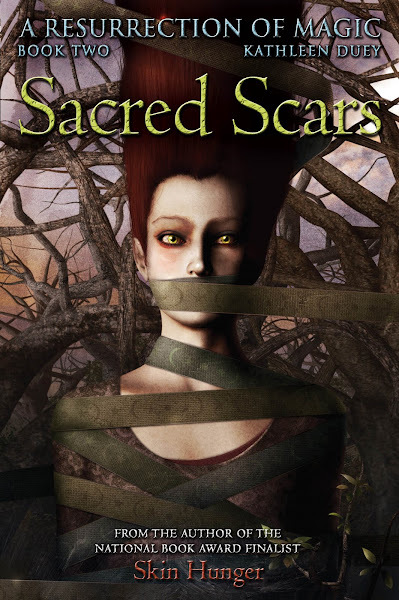 I'm now reading Sacred Scars. I am going to be very sad to have to wait for the third book to be published and available. I'm rereading the first two books in your Res. of Magic series in preparation for reading the third when it launches. Thought they were brilliant the first time I read them. Just as brilliant, but so much more the second time around. Your MCs have really touched my heart. Each time Sadima sits down to record the magic, I find myself sitting with her, thinking back to my Asian Studies major in college (when there were wolves in Wales). I would sit for hours, copying my Chinese characters. Looking forward to your upcoming Monterey seminar. Just wondering if you have an estimated released date for book #3 in the resurrection of magic trilogy?